Masu'ot Yitzhak (Hebrew: מְשּׂוּאוֹת יִצְחָק, lit. Yitzhak's Beacons) is a moshav shitufi in southern Israel. 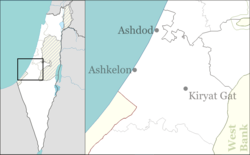 Located near Ashkelon, it falls under the jurisdiction of Shafir Regional Council. The original kibbutz in Gush Etzion was destroyed and depopulated in the 1948 Arab–Israeli War, and a new settlement was established in 1949 in a different location. In 2017 it had a population of 701. Kibbutz Masu'ot Yitzhak was founded in 1945 in Gush Etzion, midway between Jerusalem and Hebron. The settlers were young pioneers from Hungary, Czechoslovakia, and Germany who arrived before World War II. The kibbutz was named for the chief rabbi of Mandatory Palestine, Yitzhak HaLevi Herzog. The settlers of Masu'ot Yitzhak rose to the challenge of living in the Judean Mountains, building homes and planting orchards. In 1948, Gush Etzion was captured by the Arab Legion. The residents of Kfar Etzion were massacred, and all other inhabitants of Gush Etzion, including the residents of Masu'ot Yitzhak, were captured and imprisoned in Jordan. After their return from captivity in 1949, the Masu'ot Yitzhak pioneers established a new moshav of the same name near Shafir, a region inhabited by the Philistines in biblical times. Shafir had served as a base for the southern front of the Israeli army during the 1948 war, and the land on which the new Masu'ot Yitzhak was founded had until shortly beforehand belonged to the depopulated Palestinian village of al-Sawafir al-Gharbiyya. Tzahali, a military preparatory program for religious girls, is based in Masu'ot Yitzhak. ^ Eisenberg, Ronald L. (2006). The Streets of Jerusalem: Who, What, Why. Israel: Devora Publishing. p. 249. ISBN 9781932687545. ^ "מושב משואות יצחק, שפלה דרומית" [Moshav Masuot Yitzhak, Southern Shfela]. Eter HaBayit (in Hebrew). Retrieved April 16, 2019. Orit Segal (2006): Massu’ot Yizhaq Final Report, Hadashot Arkheologiyot – Excavations and Surveys in Israel, No. 118. This page was last edited on 16 April 2019, at 23:43 (UTC).